The small fountain is a replica of the former chicken hole lock. Their old stone pillars, see. Above photo are, yet get next door at the entrance of the small meadow land. When the Pfinz up in the 1930s still paved their way through the town, it was shared here by the small weir. North they went into the "Ur-Pfinz", in the so-called torrent through the meadows and fields in Won Beun. The main stream was passed since the 15th century for operating the mills and to fill the moat to Durlach. 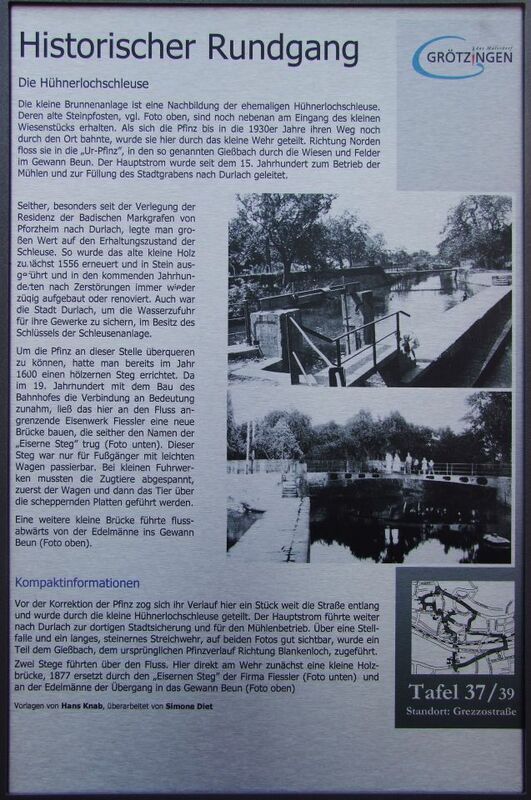 Since then, especially since the relocation of the residence of the Margrave of Baden from Pforzheim to Durlach, they put great emphasis on the conservation status of the lock. So the old small wood was first renewed in 1556 and executed in stone and built in the centuries after the destruction again quickly or renovated. Also, the city was Durlach to secure the water supply for their trades, in possession of the key of the lock system. To cross the Pfinz at this point, they had built a wooden jetty in the year 1600. Since the 19th century increased with the construction of the railway station connecting to meaning, let there adjacent to the river ferrous Fiessler build a new bridge, which has since been called the "iron bridge" wore (photo below). This bridge was intended for pedestrians only with light wagon. For small carts draft animals of the car and then the animal over the clanking plates had worn out, first be performed. Another small bridge led downriver from the Edelmänne into Gewann Beun (photo above).